The driving range at Stonebridge Golf Club Ann Arbor is open to the public. The practice facility is a full service arena where you can work on all aspects of your game from putting, to chipping, sand shots and driving. Practice putting greens are also available to work on your short game. The driving range features bent grass tees and a chipping bunker. Tokens can be purchased in the Pro Shop and balls dispense from the ball machine located on the Driving Range. Golf lessons are available from our PGA Class A Teaching Professionals. 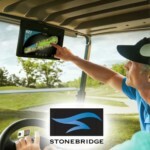 Stonebridge offers a variety of summer programs for Adult and Junior Golfers. Visit our Junior Golf Camps and Clinics page to register your child or visit our Adult Golf Clinics page to see our variety of mixed and women only clinics. Do you like to practice everyday? Then the UNLIMITED Driving Range pass is for you! Up to two large buckets of balls per day all season.